An Ornamental Bracelet worn on the Upper Arm of the Bride. Bajuband in Hindi, Vanki in Tamil. Generally worn by brides as part of their Solah Shringar. Else, it could also be sported with Western Wear for a Funky Look. Worn on the Upper Arm and forms part of the Solah Shringar of the Bride. Used on festive occasions such as weddings and family functions. Also, used by Classical dancers to complete their look, for instance the Bharat Natyam & Kathak Dancers. Could be made of Silver or Gold and encrusted with precious gems. They are available as a string of Pearls or other stones and can be tied around the arm. 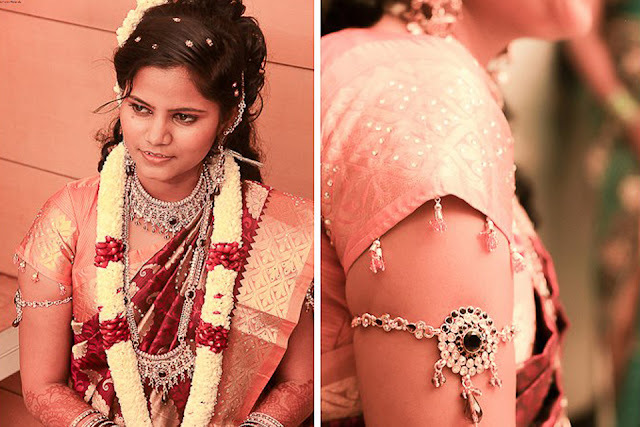 South Indian Brides generally adorn the Gold Vankis for their Wedding Ceremonies. Usually available in Jewelry shops or Fancy Stores. As is the case with the rest of the Solah Shringar, the usage of this ornament dates back to pre-historic times with references in the sacred scripts. It used to be worn by both Men & Women in Asian Countries. Used even in the army in the form of a cloth or a Badge that is tied to the upper-arm, it carries the army camp’s symbol or the ranking of the official. Very often, Armlets are given away in Temples, believed to ward off ill-luck or provide protection.